An adventurer needs to carry a lot of gears especially when they are on hiking or camping. Therefore, they need bigger storage to keep their stuff. As the travelers already carry much weight at hiking, so they won’t prefer a heavy weighted backpack at all. And so, they need a backpack which is lightweight and comfortable as well. Otherwise, it will be a painful journey. If you are in such condition and searching for a premium quality backpack, then we can recommend you to check Maxpedition SOLODUFFEL Adventure Bag. Well, if you are wondering why Maxpedition, not the others, then have a look at the features of this bag. We hope after reading this product features, you will agree with us about why it is good for you. 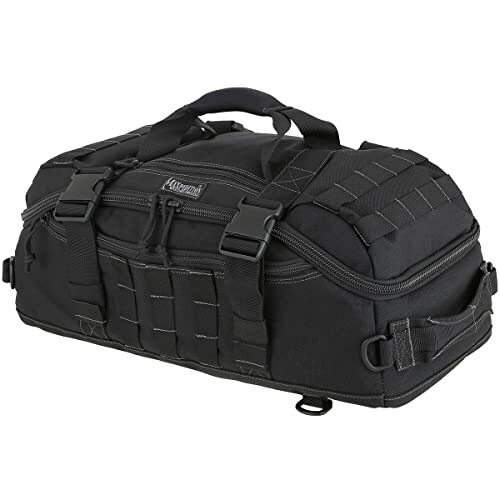 It ensures comfort and gives enough room to store your necessary tools. It is also very supportive in the rough situation, and so you can easily travel more kilometers with this. It can be a wise decision to select this bag for your upcoming adventure. Like the other backpack it has a main compartment to store your gears. The main room is big enough to keep your laptop along with other necessary stuff. This area will provide you 1330 cubic inches of space which is enough for two-three days of clothing. It features clamshell opening which allows easy access to your gears. It has an internal retention strap to help secure gears. All four sides of the main compartment are padded. The back of this bag has a padded back compartment including zipper closure to keep the stow-away from ambidextrous padded sling strap. You can attach the padded sling strap with two lower D-rings. This strap also has a derp-lex buckle for quick removal. This strap will allow you to carry like normal bags. The other carry option comes with a removable non-slip shoulder strap which is also padded. This strap is attached to two upper D-rings. Besides that, you can attach the shoulder strap with other D-rings for better configuration. Therefore, you can carry this by your shoulder and can avoid intense pressure. If you don’t want to carry this bag by your shoulder, then there is one top padded handle on the bag. Additional Features – You will get a long mesh pocket in the main compartment for storing some climbing gears. There is an additional small pocket beside the long mesh pocket to keep your glasses or other sensitive stuff. YKK high strength zippers and zipper tracks ensure the security of your gears. This adventure bag is lightweight and makes you feel comfortable in any situation. Maxpedition always tries to create excellent quality bags to satisfy their customers. They are well-known and have a good reputation for over 15 years. So, we hope that you won’t regret buying their stuff. Though this backpack is not enough to get room facility for your long trips, this is an ultimate travel bag which is adequately sized to carry-on luggage dimensions. However, most of the travelers find all the features of this backpack useful and suitable for use. Hope, this review will help you to get your next travel bag.